Veal Milanese is one of my favorite dishes. It’s commonly made with veal scallops, breaded, panfried and topped with an arugula salad. One of the restaurants in our area use a bone-in veal chop and they have the freshest salad with thinly sliced red onions, sweet cherry tomatoes, and a delicious lemon vinaigrette. I’ve recreated the recipe and for a little twist, add a slice of mozzarella on the panfried chop. Take abone-in veal chop and pound to flatten a bit, not super thin like the veal scallop. Season with salt and pepper, dip in flour, beaten egg, and breadcrumbs, I prefer Panko. Heat about one-half inch oil in a skillet over high heat. 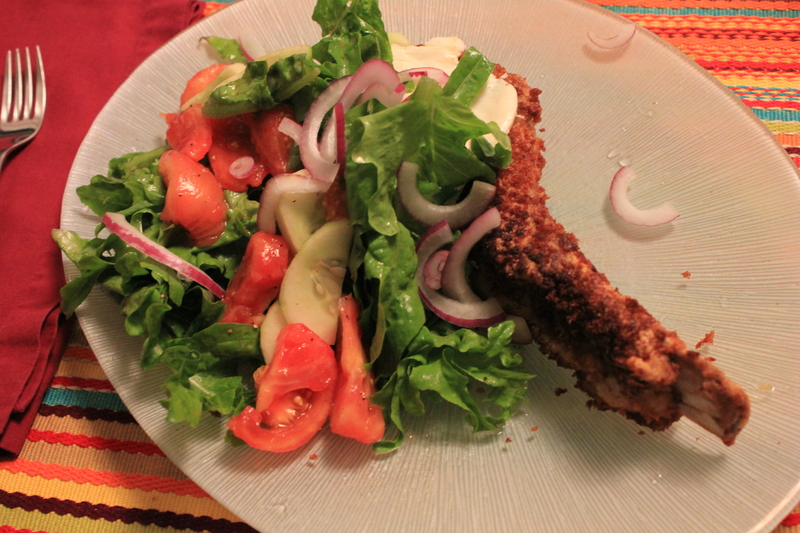 Once the oil wavers a bit, place the breaded chops in the hot oil. Cook about 3 minutes or until golden brown, turn and cook and other 3 minutes. or until golden brown. Remove to a baking sheet, top each chop with a slice of fresh mozzarella and pop into the preheated oven for a 3 minutes. Top with a crispy, peppery green salad of arugula, sliced red onion and tomatoes and cucumbers dressed in a simple red wine vinaigrette. Shaved Parmesan cheese is a delicious garnish or use our tricolor salad. Veal milanese is a panfried veal scallop or bone-in chop topped with a peppery green salad of arugula with a tangy vinaigrette. Combine the oil, vinegar, mustard, salt and pepper in a covered jar and shake or in a bowl and whisk. Top with a crispy, peppery green salad of arugula, sliced red onion and tomatoes and cucumbers dressed in a simple red wine vinaigrette. Garnish with shaved Parmesan cheese. Alternatively, use our tricolor salad.